These insects are coloured green or brown with patterns and markings of all kinds. They have enlarged hind legs which enable them to jump into the air - although they also have wings for flying. They are active during the daytime, but you will struggle to see them in the long grasses of meadows and heathland. However, you will easily hear them - especially when the weather is hot and sunny. 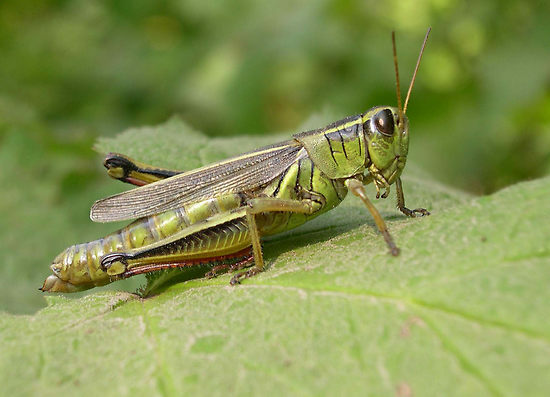 The male grasshoppers make a 'singing' noise to attract females by rubbing their hind legs against a hard, thick vein on the edge of their wings. then proudly puff out it's chest. there's no event it wouldn't win. the 50K walk might cause it a few problems!